Several thousand years ago in what is now Estonia, a child was buried with a flute made from a bird’s bone and with crane wings placed in his or her hands. Too young to have likely been a shaman or initiate, the child — whose elaborately arranged grave was excavated by archaeologists in the 1970s — was probably a member of a secret society, says Brian Hayden, an anthropologist at Simon Fraser University in British Columbia. In anthropological parlance, secret societies are a type of elite quasi-religious organization seen time and again in cultures that are on the transition point from small, kinship-based egalitarian hunter-gatherer bands into more complex and hierarchical societies. The first thing to know about these kinds of secret societies is that they are not that secret — their existence and membership are public knowledge. What remains secret about them is their members’ claim to exclusive possession of wisdom and power for controlling aspects of the universe. Such power comes at a cost: like an upscale golf club, secret societies maintain their exclusivity in part through steep initiation fees. Thus secret societies can only exist in cultures where it is possible for individuals to amass a surplus — the societies are born out of economic inequality and one of their primary functions, Hayden says, is to entrench it. “Members wield incredible power just on the basis of their wealth and influence, but they also claim to have even more powers in terms of being able to provide for the welfare of the community,” Hayden says. This power makes society membership lucrative — members can demand tributes or taxes from other community members for performing the special religious rituals that they claim are necessary for the community’s world to continue. Hayden believes that part of the reason that the secret society model is such a common cultural strategy is because the societies are able to become institutions that surpass the limits of kinship and exceed the lifespan of any individual leader or member. As such they may represent an important pathway for cultures’ evolution from small bands of hunter-gatherers into established societies with state religions and political structures capable of marshalling resources to build something like a Stonehenge or a ziggurat. Even when direct knowledge of their existence is lost to time, Hayden says that secret societies tend to leave a set of telltale marks on the archaeological record. Often, a key sign is the discovery of ritual structures that clearly took a lot of resources to build, but that could only accommodate a few people. “You don’t have the equivalent of churches where you have large constructions for the entire community — what you have is very small structures for a very exclusive number of people,” Hayden says. These structures and recovered ritual objects are often marked by a high level of artistic effort. Works like the upper Paleolithic cave paintings were almost certainly created by specialist artists who had trained over many years, Hayden says. “And in order to do that, you need to subsidize some of the artists.” In his view, secret societies help make such artworks possible by generating both the demand for such works and the wealth needed to subsidize high-skilled, time-intensive projects. In prehistoric times and today, secret societies are frequently associated with awe-inspiring “power animals” — lions, wolves, bears, mammoths, bison, eagles, and other creatures that would typically be feared or avoided by everyday people. Awe could be instilled by other means as well: in his survey work on secret societies, Hayden says he was particularly surprised by how often he came across documented evidence of cannibalism, such as cooked human skulls buried beneath the posts of ritual structures. Within many secret societies, “it’s fairly common to have some sort of cannibalistic practices to create fear and trembling in the younger members or to create emotional states that are meant to impress,” he says. Hayden’s work on the role of secret societies in cultural change has involved a mix of surveys of existing ethnographic and archaeological literature as well as ongoing hands-on research, particularly with collaborator Suzanne Villeneuve at the Keatley Creek dig site in British Columbia. The site includes the remains of an elaborate winter village occupied more than a thousand years ago. 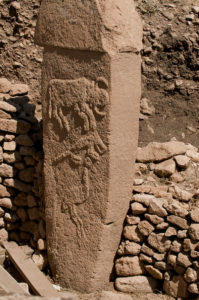 “Just outside of the village about one to two hundred meters from the edge of the village there are some very small structures that puzzled us for many years,” Hayden says. Now he and Villeneuve think that the structures — and the remains found in them of what were likely exclusive ritual feasts of salmon soup — perfectly fit the pattern of secret societies that he has observed elsewhere. If they are, they represent the first known evidence of secret societies along the Pacific Coast north of California.